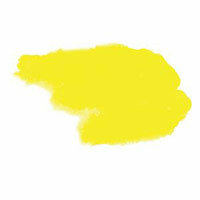 This semi-transparent yellow green appears opaque in mass, yet lifts cleanly. Bismuth Vanadate Yellow is low staining, making it excellent in portrait mixtures for dark flesh tones. Use concentrated to diluted mixtures in florals and field flowers. This lemon yellow hue works well with purples and all the greens. DANIEL SMITH EXTRA FINE WATERCOLOUR STICKS offer the same superior intensity as the DANIEL SMITH line of EXTRA FINE WATERCOLOUR paints with the convenience and portability of half pans. Each stick is packed with pure pigment and produces vibrant, strong colour when wet or use them dry to build texture. They are highly reactive with water and release rich, creamy colours. For sketching, developing colour values and bold expressions, DANIEL SMITH EXTRA FINE WATERCOLOUR STICKS are a truly valuable addition to every artist's palette. Click the button below to add the Bismuth Vanadate Yellow Daniel Smith Ex. Fine Watercolour Stick to your wish list.